Losing your hair is a serious part of your treatment. So it’s no surprise that you’re worried about it. “What can I do to feel beautiful? Will I still look feminine? Help, my face looks so pale. Which colours suit me?” and so on. These simple tips will help you look better and feel stronger. Choose a chemo scarf or hat with pleats or gathers. They create a nice volume, which is often helpful because your head might well look a bit smaller without hair. Depending on the shape of your face, you can place your hat or chemo scarf higher or lower on your forehead. If you have a low forehead, it might be nice to wear your headwear a little higher. If you have a high forehead, try covering half of it with the border of your hat or scarf. Make sure your hat or scarf comes down low enough at the back, so that it covers your natural hairline. You can cover all or part of your ears. If you like to wear earrings, make sure your earlobes are not covered. 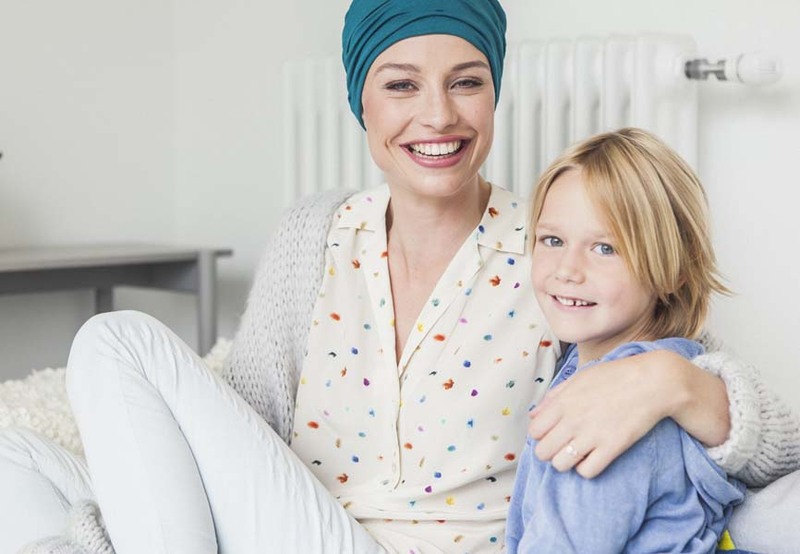 During chemotherapy, don’t be afraid to leave behind the safe, simple colours you might otherwise wear. Bright colours can work miracles, lighting up your face and your mind. You will look better and feel energised. We bet people will compliment you on your wonderful colour choices! Are you wearing a dark outfit? A dark hat in the same colour is not necessarily the best choice. A brighter or complementary colour in a lighter shade will elongate your silhouette and highlight your face. A dark blue outfit, for example, has more pizzazz with a raspberry-coloured scarf or a burgundy hat. Try a chemo hat with a pattern or print as well to make a plain outfit more exciting. We always like to choose a flattering print with lighter colour accents to light up your eyes and your skin. And our prints are so trendy that they look like a hip fashion accessory! Which fashionable colours should you wear this season or the next? Follow our blog for regular updates about the newest colour trends. Dare to use a bit more make-up. Touch up your lips with some lipstick or accentuate your eyes. If you lose your eyelashes due to chemo, then use eyeshadow instead of eyeliner. It looks softer and more natural. Are you curious to see how make-up can change your face? Then get inspiration from these four stunning makeovers for chemo patients. Turn your chemo hat into a trendy accessory by accessorising it with earrings, a necklace or a brooch. Choose colourful, larger, more striking accessories to turn your wraparound hat into a real fashion item. You will find several articles on our blog full of inspiration to help you feel better and look good during your treatment. We also provide answers to all your questions about hair loss, hair growth after chemo, chemo and your eyelashes and much more. Follow us on Facebook for the latest news and updates and join the discussion about hot topics, including hair loss or alopecia, chemotherapy, cancer and other issues.